Researchers at the University of Delaware have discovered that when the leaf of a plant is under attack by a pathogen, it can send out an S.O.S. to the roots for help, and the roots will respond by secreting an acid that brings beneficial bacteria to the rescue. The finding quashes the misperception that plants are "sitting ducks"--at the mercy of passing pathogens--and sheds new light on a sophisticated signaling system inside plants that rivals the nervous system in humans and animals. The research was led by Harsh Bais, assistant professor of plant and soil sciences at UD, former postdoctoral researcher Thimmaraju Rudrappa, who is now a research scientist at the DuPont Co., Kirk Czymmek, associate professor of biological sciences and director of UD's Bio-Imaging Center, and Paul Paré, a biochemist at Texas Tech University. The study is reported in the November issue of Plant Physiology and also is featured on the journal's cover. Rudrappa is the lead author of the research paper. "Plants are a lot smarter than we give them credit for," says Bais from his laboratory at the Delaware Biotechnology Institute. "People think that plants, rooted in the ground, are just sitting ducks when it comes to attack by harmful fungi or bacteria, but we've found that plants have ways of seeking external help," he notes. In a series of laboratory experiments, the scientists infected the leaves of the small flowering plant Arabidopsis thaliana with a pathogenic bacterium, Pseudomonas syringae. Within a few days, the leaves of the infected plants began yellowing and showing other symptoms of disease. However, the infected plants whose roots had been inoculated with the beneficial microbe Bacillus subtilis were perfectly healthy. Farmers often add B. subtilis to the soil to boost plant immunity. It forms a protective biofilm around plant roots and also has antimicrobial properties, according to Bais. 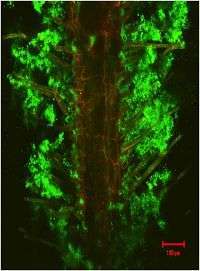 Using molecular biological tools, the scientists detected the transmission of a long-distance signal, a "call for help," from the leaves to the roots in the plants that had Bacillus in the soil. The roots responded by secreting a carbon-rich chemical--malic acid. All plants biosynthesize malic acid, Bais explains, but only under specific conditions and for a specific purpose--in this case, the chemical was actively secreted to attract Bacillus. Magnified images of the roots and leaves showed the ratcheted-up defense response provided by the beneficial microorganisms. Czymmek captured the definitive proof using a state-of-the-art LSM 510 DUO laser scanning confocal microscope in UD's Bio-Imaging Center. UD is among only a few universities that own one of these million-dollar instruments. "A plant is a challenge to image because at least half of it is below ground in the form of roots," Czymmek notes. "Here at UD, we use modern technologies including hydroponic growth systems with see-through chambers and sophisticated optical techniques that will enhance the image clarity when visualizing plants and the pathogens attacking them." Bais and his colleagues are now working to determine what the aerial signal is from the infected leaf to the root using different pathogen-associated molecular markers (PAMPs). The research not only sheds light on the remarkable signaling system in plants, but also is important to understand how invasive plants conquer new territory with the aid of plant microbes. "Plants can't move from where they are, so the only way they can accrue good neighbors is through chemistry," Bais notes. Cannabidiol: Rising star or popular fad?